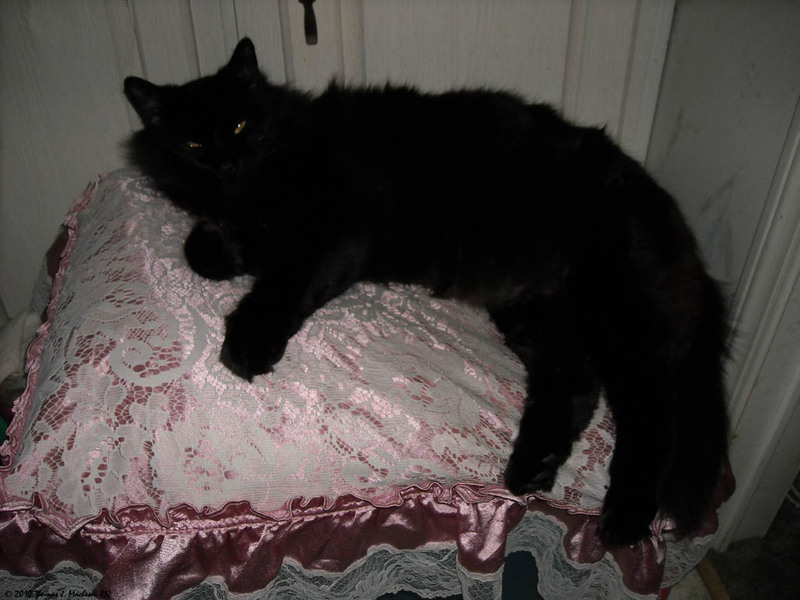 Lounging regally upon his fooftah pillow, 3of4… - Ramblings of Mad Shutterbug & the Border Collie Bros.
Lounging regally upon his fooftah pillow, 3of4 KittehsOfApocalypse AKA Fooftah deigns to open his eyes and glare at the intruder interrupting his nap. Today's weather is... wet, here. Will be again tomorrow most probably. Warmer, and therefor hinting of Spring. We've also seen a lot of Robin Redbreast, and I am wont to think fondly of my mother when I do. She loved Robin Redbreast and I suspect not least of her reasons for this included that seeing them in Michigan truly meant that Spring arrived. Weather today providing a bit more data to figuring out the problems connecting to Flickr, because initially this proved not so successful from home today. However, now we've uploaded to there and to here and... achieved Pic'o'Day. However, my knees and elbows are unhappy about the pressure changes. I Have also in this cold wet winter been keeping my eye on robin redbreast. He feels me with knowledge that soon soon it will be spring.